An indescribable magic surrounds the Big Apple during the holidays. You sense it in the gorgeous strings of Christmas lights suspended along the NYC streets, the giant sparkling tree at Rockefeller Center, and the ice skaters whizzing around the rink at Bryant Park. But the extravagant displays produced for the city’s department store windows are what capture the magic perfectly. Each store or design house has something unique to offer when it comes to theme and execution, making it almost impossible to pick a favorite. 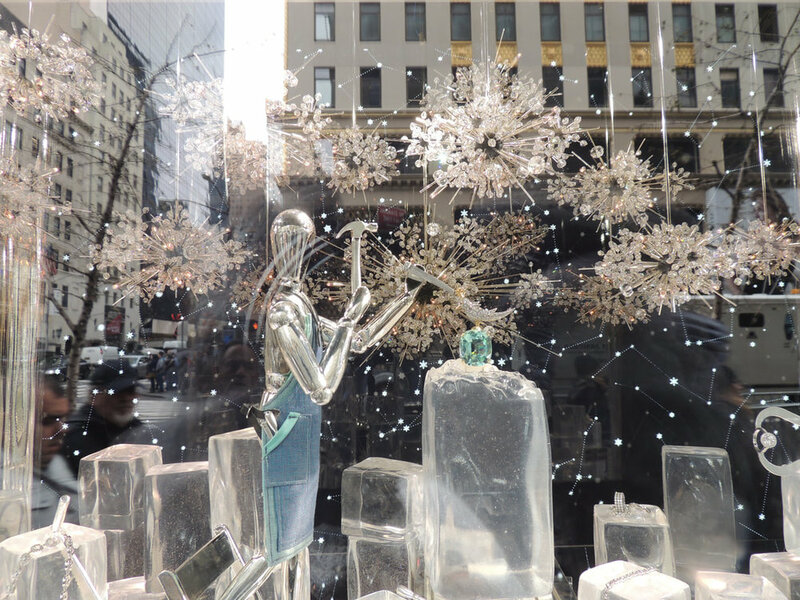 Read on to hear about the most spectacular holiday windows, and, if you can, see them in person before they’re taken down shortly after New Year’s! 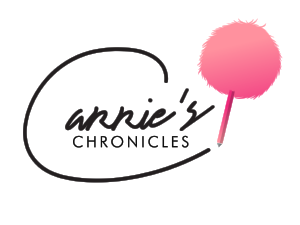 The first store I visited was Barney’s, located between 60th and 61st Street on Madison Avenue. This year's windows were inspired by the Haas Brothers, a popular L.A.-based design duo known for their signature playful innovation. Barney's also transformed their windows into a social media campaign that is aimed to spread diversity and inclusion this Winter. Every time someone hashtags their window photo “#HAASRULES,” on social media, the Barneys New York Foundation donates $5 to the Children’s Defense Fund, an organization dedicated to ensuring children’s safety, health, opportunity, and overall well-being. How cool is that?! And get this: Barney’s has raised thousands already thanks to the pics people hashtagged on Instagram! 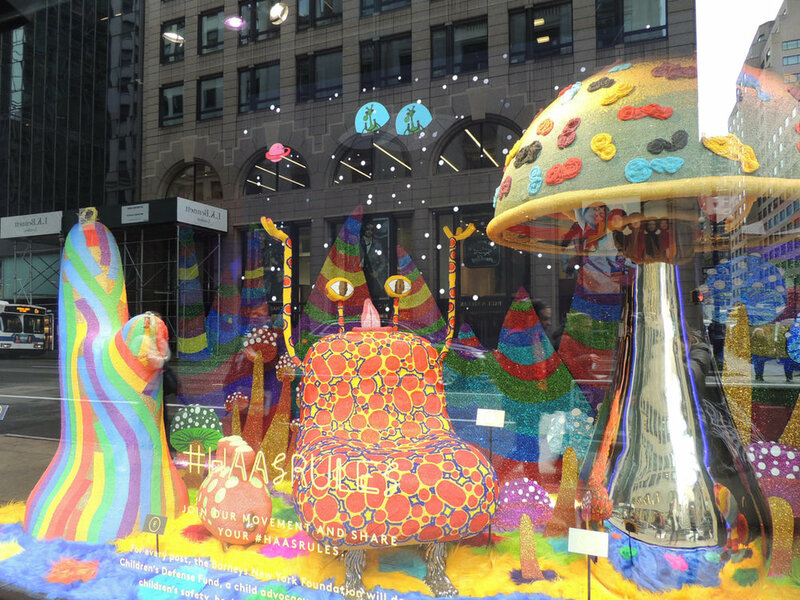 I made sure to snap all the standout details in the windows: the vibrantly beaded futuristic figures, the colorful giant mushrooms, the sparkling lava rocks, and the Haas character “Rainbow Baggins,” a rainbow striped zebra! All were inspired by "animation and the imaginative universe" making this year's Barney's display truly out of this world! The next destination I visited was Bloomingdale’s, located between 59th and 60th Street on Lexington Avenue. The theme of their windows was based on the new movie musical The Greatest Showman starring Hugh Jackman, Zac Efron, and Zendaya. The movie is based on the colorful showman, P.T. Barnum, founder of Barnum and Bailey Circus, and the windows do not fail to capture his spirit. Each display showcases the essence of the circus, from the vibrant red and silver sequins to the literal circus acts posed on mannequins both in the windows and inside the store (acrobats, contortionists, dancers, knife throwers, jugglers, bearded ladies…). The fashion exhibited was especially extraordinary, featuring a dazzling array of glittery glass gems by Allison Eden Studios. My favorite looks were the perfectly tailored red and gold military jacket, an aerialist’s flame-inspired two piece set, and a pair of velvet pants with subtle ruffle detailing down the side. The store also decided to give onlookers an interactive experience to remember: an animatronic fortune teller (ala Zoltaire) that displays a digital fortune, and a camera button that puts a photo of your face on a ticket poster and incorporates it into the display! Eager for more? Come to Bloomies and join the circus! The next stop, which I later determined was my favorite, was Bergdorf’s. 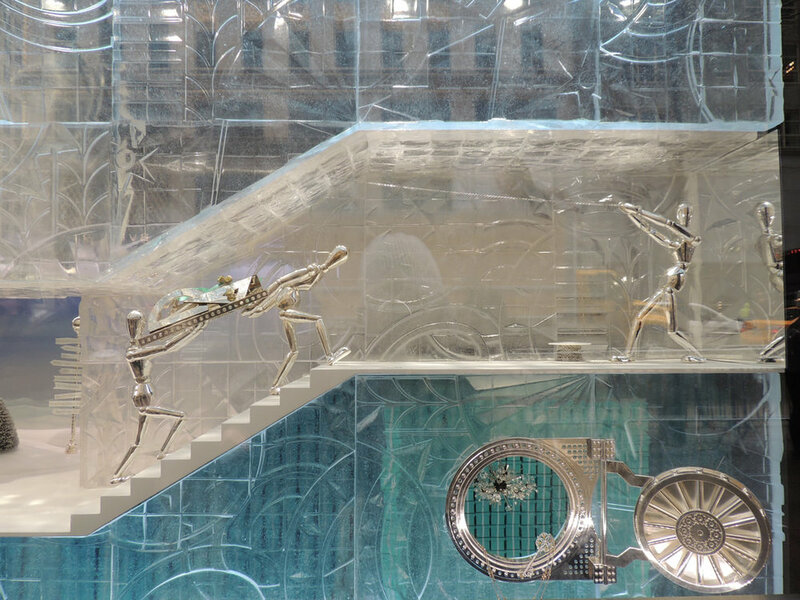 Located between 57th and 58th Street on 5th Avenue, the high-end department store presented an array of innovative windows with a Big Apple theme. 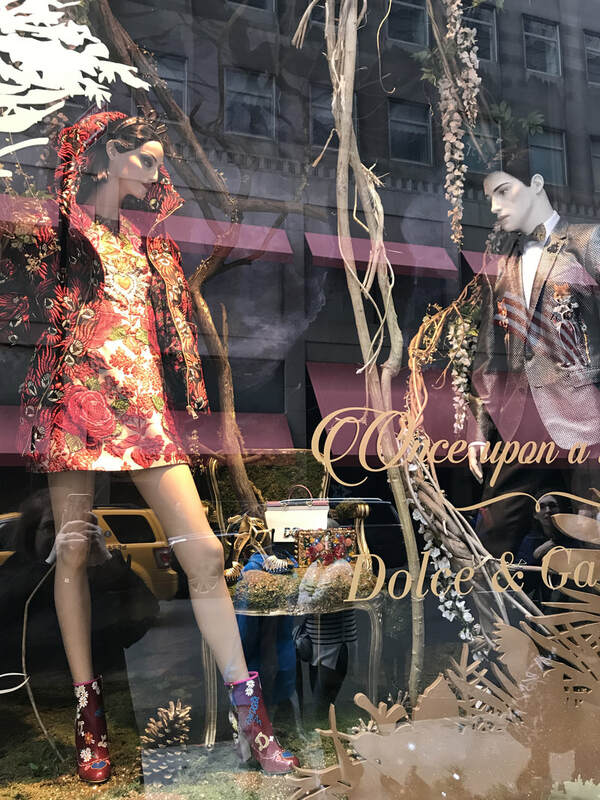 The title of their 125th anniversary windows was, “To New York With Love.” I was immediately struck by the creativity and breathtaking fashion inspired by NYC's cultural institutions--the execution and attention was absolutely exquisite. One of the highlights for me was the window celebrating the American Museum of Natural History with Swarovski crystal-covered dinosaurs and a woman in a glittering silver gown. If that wasn't dazzling enough, the window inspired by the Museum of Moving Image spotlighted an ombré gown that utilized black feathers descending into white fabric...pure genius. As for the actual background of the displays, the one dedicated to the famed New York Philharmonic took my amazement to a whole new level. 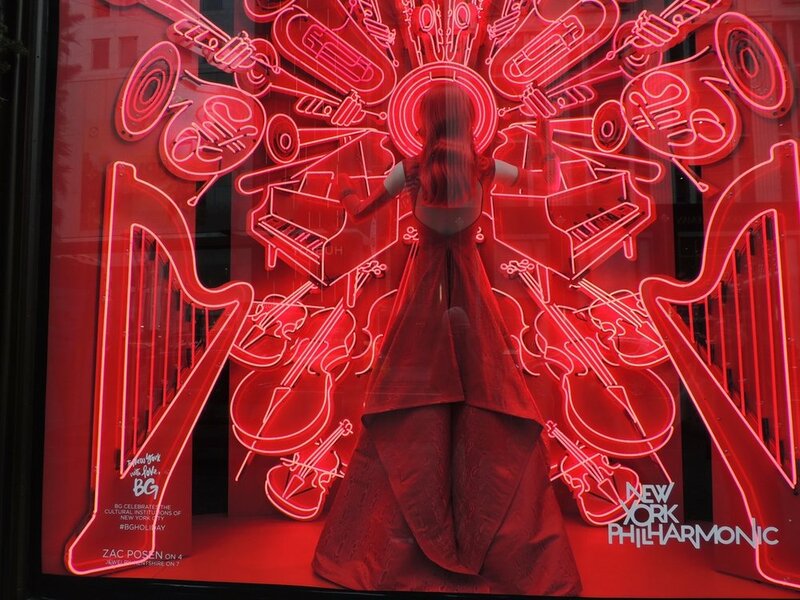 It featured red neon lights in the shapes of different instruments, such as a piano, trumpet, or violin, with a woman in red conducting. The Bergdorf displays truly hit no wrong notes! 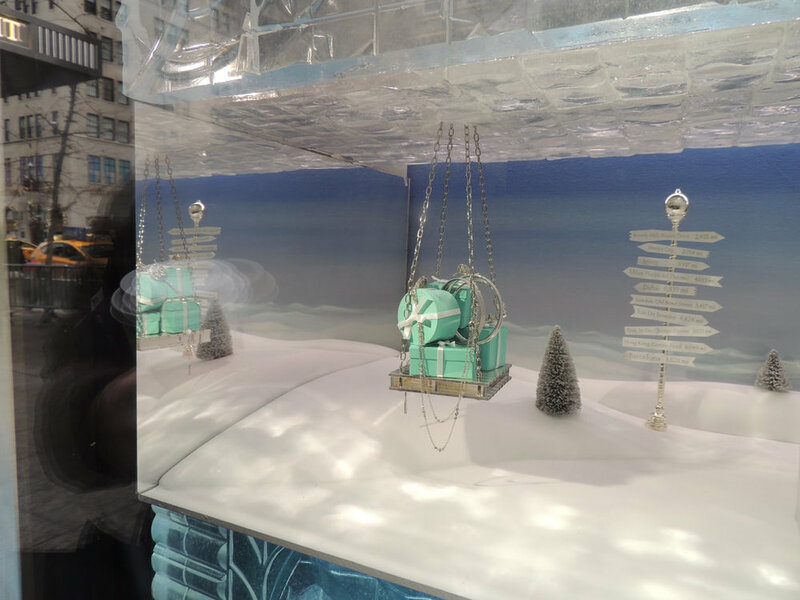 Tiffany & Co.—one of NYC’s most renown luxury jewelry stores located on 57th Street and Fifth Avenue—doesn't have the largest window displays, but they are still exquisite. 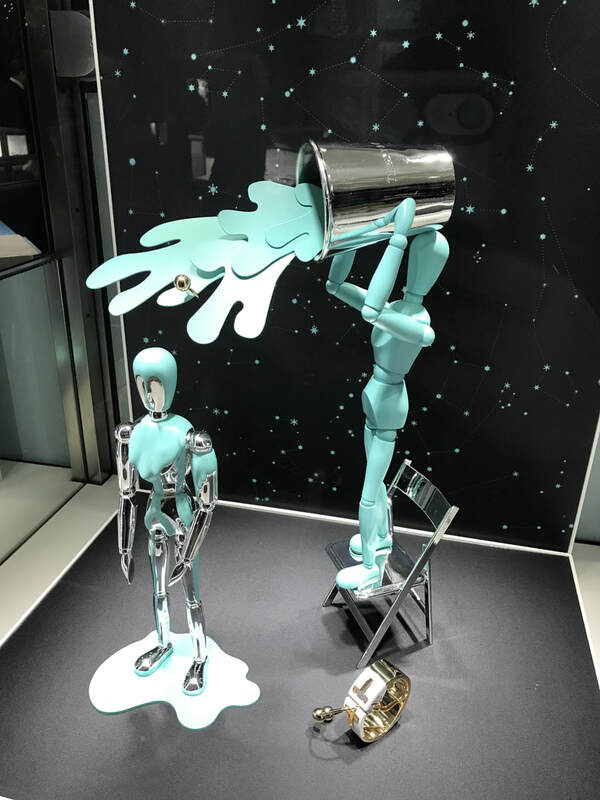 Both in the windows and inside of the store, they showcase silver, miniaturized robot-like figures that are working to produce Tiffany's jewelry, either carrying it on their backs or using tools to construct the pieces and pack them off in little blue boxes. Each window is filled with millions of dollars in diamonds--it doesn’t take hard work to know how incredible that is! 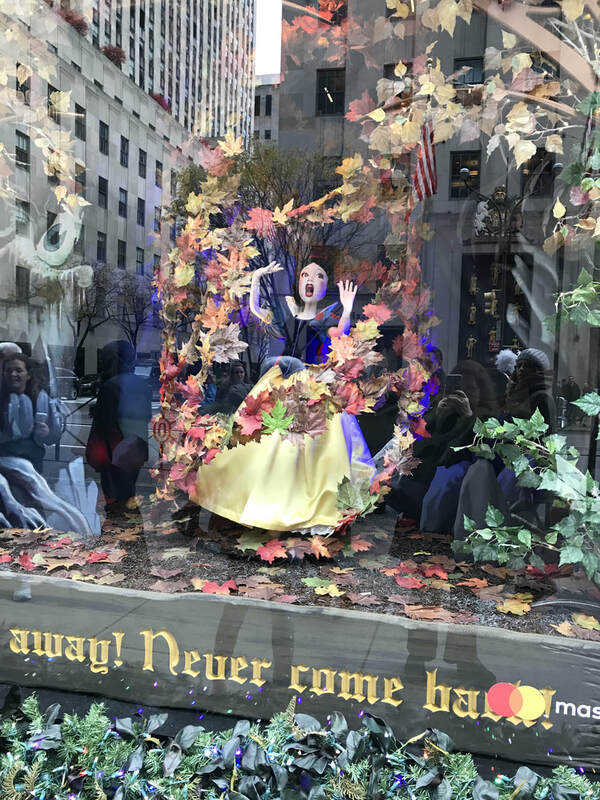 My last visit was to Saks Fifth Avenue to see the story of Snow White retold through numerous window displays. The posh department store—located between 49th and 50th Street on 5th Avenue—chose to celebrate the well-known Disney film just in time for its 80th anniversary. The result: a visually detailed collection of displays (titled “Once Upon a Holiday”) with a creative use of animatronics (my favorite was the elderly beggar woman who spun around to reveal her true self, the Evil Queen). 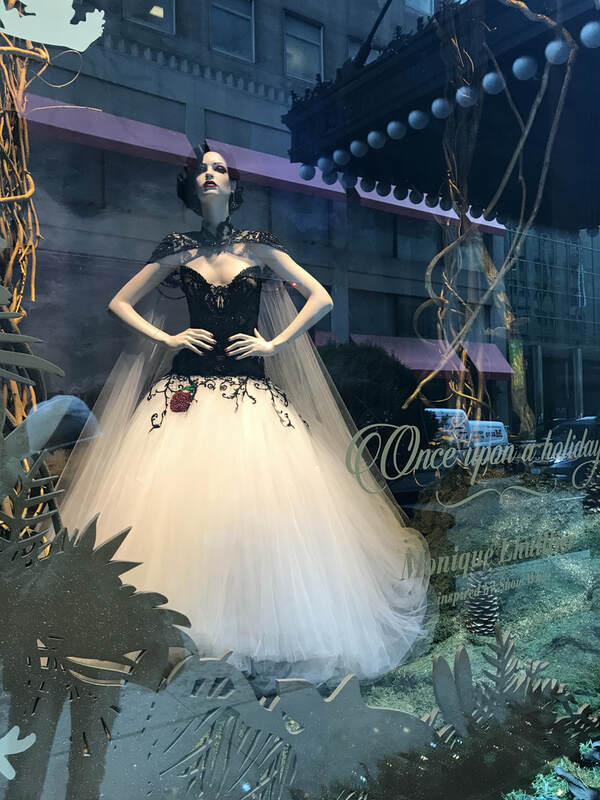 What was truly special about Saks’ exhibition was what appeared in the windows around the corner: there were several custom ensembles designed for a modern day Snow-White. The high end designs—set against forest backgrounds that perfectly capture the spirit of the film—were created by some of the most prominent names in fashion, including Alberta Ferretti, Naeem Khan, Monique Lhuillier, and Marchesa. My favorite design was the red and black puffer coat by Dolce & Gabbana; it was the perfect way to combine high-fashion, winter style, and Disney's Snow White. Some of the department stores made collections and are selling pieces that relate to their window displays! Check out some of my faves below.